Have You Been Diagnosed with Breast Cancer? If so, perhaps you’re still dealing with the emotional shock that comes with a cancer diagnosis. And, you’re probably overwhelmed with questions. How extensive is the cancer? Will you need a mastectomy? Chemotherapy? 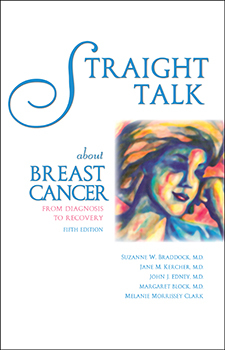 Author Suzanne Braddock, M.D. understands how you feel. Even though she is a physician, she too was filled with such questions when she was diagnosed with breast cancer. Breast self-examinations—how can they save your life? Breast lumps—when should you have a biopsy? What to expect from treatment—surgery, chemotherapy, radiation? Breast reconstruction—now or later? What does reconstruction look like? Hereditary breast cancer—are you or your daughters at risk? Eight pages of reconstruction photos, resource section, glossary, index, illustrations and photos throughout. More than 150,000 copies in print!